The world would be a better place if we all treated each other a little nicer. Maybe if good manners were assigned a monetary value, more people would be on their best behavior. This is exactly what a few restaurants and coffee shops have done. In the process, they have received positive coverage from bloggers and other online media outlets. In the age of where news stories can be found on search engines for years and people can spread the message via social media and online review sites, this kind of coverage can definitely make a positive impact on the business’s bottom line. Here is a list of some of restaurants and coffee shops that I have heard about lately that have used this tactic to get people talking about their businesses. Back in 2013, a Washington eatery got mentioned on TODAY.com for giving Laura King and her family a $4 discount on their bill to cover a bowl of ice cream that the owners gave the family because their children were so well behaved. “An image of the receipt quickly went viral after one of King’s friends posted it online,” the article continues. While not all the mentions that the restaurant received were positive, the discount got people to talk about the restaurant on social media sites, which led to some great coverage in the national news media. Furthermore, articles about the post still show up on a Google search engine results page (SERP) over two years after the post went viral. 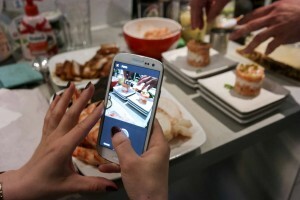 As an article on The Huffington Post points out, several restaurants have tried to encourage better dining etiquette by offering a discount to customers when they put their smartphones away while they are at the dinner table. Other restaurants have even gone so far as to ban the use of cell phones in their restaurants all together. As the Huffington Post article mentions, this policy has sometimes been met with outrage. Whether people agree with this type of policy or not, it has generated some attention. Furthermore, it has gotten people to talk about whether or not cell phones should be used as much as they are at the dinner table. On the other hand, it also needs to be noted that this policy does prevent customers from taking photos of their food and sharing them on social media sites. This, too, can be a great way to get people talking about the restaurant and possibly get them to visit the establishment in the future. In October of this year, NPR featured a story about an Israeli restaurant in Kfar Vitkin, north of Tel Aviv, that is giving a 50 percent discount to Jews and Arabs who eat together. At the time the article was written, the offer had only been redeemed by 10 tables. However, business has increased by 20 percent. The article mentions that a substantial part of the boost was from local and foreign journalists. Offering customers a discount for good manners can also generate good will and positive mentions online. According to an article on the Daily Mail, the owners of the coffee shop don’t enforce the policy. However, they said it brings a smile to many of their customers’ faces and many customers go out of their way to be courteous. Even if it isn’t enforced, the sign has created enough attention to be covered by online media outlets. It is interesting to note that this idea was copied, with similar results, by a French café. Okay, this one isn’t really about getting customers to change their actions. In fact, it is actually the restaurant that is going out of its way to be courteous to its customers. The buzz started when a customer posted a photo of a sign that was hung on the door of George’s Senate Coney Island Restaurant in Michigan that stated that anyone who would be home alone on Thanksgiving could come to the restaurant and get a free meal on November 26, 2015. Not only did the story go viral on social media, it was covered by many of the traditional media outlets, as well. And, while the restaurant will probably be giving out more meals than it originally planned, the free publicity that it received is priceless. As I said at the beginning of this post, the world would be a better place if people chose to be nicer to each other. Businesses often have an opportunity to remind customers of this. As shown in this post, incentivizing good behavior is not always met with open arms. In fact, sometimes, it is met with outrage. However, when done correctly, little things that remind us that we need to coexist peacefully and show respect for others can get people talking about the business online. Sometimes, this will lead to further coverage in more traditional media outlets. Furthermore, social sharing is only part of story. When customers search for information about the restaurant on Google or any of the other search engines, a positive story like this is likely to appear on a SERP well into the future. That might be enough to get potential customers to visit the restaurant long after the deal ends. And, if nothing else, the business might start a conversation that can make the world a better place. 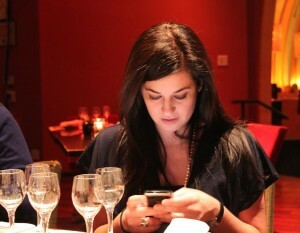 Photo credits: leyla.a and Social Media Dinner on Flickr.